My Latest and Greatest Chronic Pain Management Techniques - Real Food. Real Fitness. It seems ever since I had baby #4 many of my old chronic aches and pains have resurfaced mostly in my neck and back. Fluctuating Hormones, lack of sleep, holding/wearing baby and nursing my babe on demand day/night definitely contributes to these annoying and sometimes debilitating pains. Pushing myself physically in my workouts does not always help the situation! I am a firm believer in the body wanting and striving to be in a state of homeostasis and if given the right tools will do so on its own. Switching my diet to a REAL food paleo/primal based foods has helped with inflammation no doubt but I am still working on that missing puzzle piece of why I get flare-ups. Chronic pain is no joke! For those of us suffering the pain can be debilitating and even depressing because you struggle alone. That is why I AM SO EXCITED to share with you my latest pain management techniques that are WORKING without the harmful side-effects of medication or even surgery! Even better they are natural, homeopathic, ancient healing methods that have NO harmful side effects of medications. So give them a try and let me know how you feel! Acupuncture-is a form of alternative medicine and a key component of traditional Chinese medicine involving thin needles inserted into the body at acupuncture points. Acupuncture is often used for pain relief but is also used for other conditions. I promise you it’s not as bad as it sounds! If you go to a good acupuncturist you hardly feel any of the needles. Oddly enough it is actually relaxing. My latest treatment involved about 20 needles inserted everywhere from my ankles to the top of my head. Once the needles were in place I had to lay still for 30 min. It’s in that 30 min that I could actually feel my body relax and good things happening! Epsom salt baths are known to ease pain and relieve inflammation, making it beneficial in the treatment of sore muscles. I take an ES bath 2-3x a week and put 2 cups of Epsom salt into warm bath water and soak for 10-20 min. 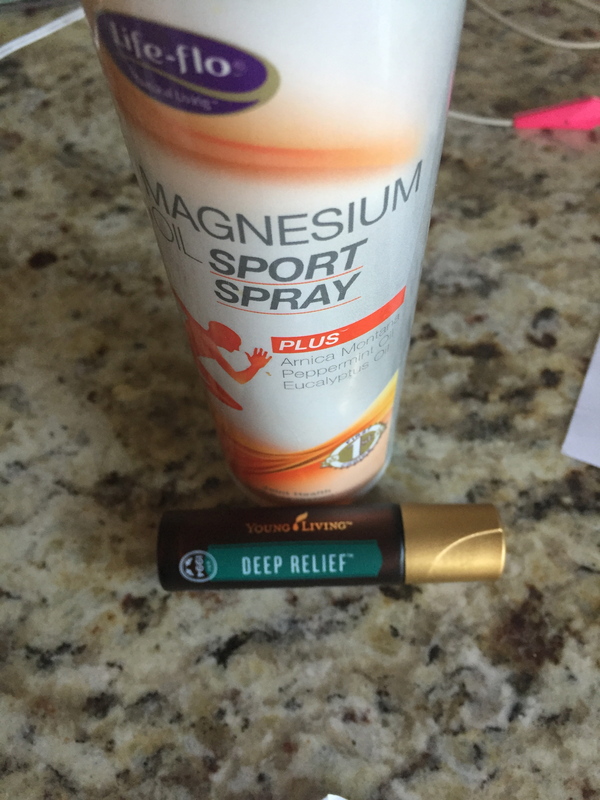 Magnesium Sport Spray plus arnica, peppermint oil, and eucalyptus oil is my go to everyday relief. The Magnesium in the spray helps relax tense muscles and relieve muscle spasms. Easy peasy spray it on wherever you are sore a few times a day. Young Living essential oil deep relief roll on is another easy go to pain reliever I have found to be extremely effective. It is a mix of essential oils that work together relaxing and healing tender sore spots on the body. O.K. BRACE yourself for this one.! I recently had my 1st ever Guasha experience. 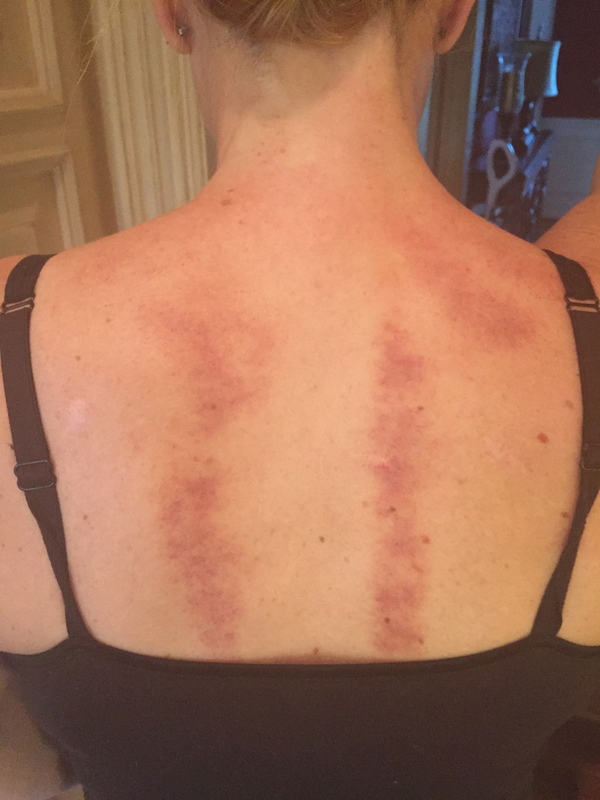 Performing guasha (done by an acupuncturist) involves taking a specific ceramic spoon and repeatedly rubbing or scraping the tool on the skin over the sore area. It is done very gently and does not hurt one bit! Traditional Chinese Medicine believes muscle soreness and injuries are in essence traffic jams of blood and qi or energy. Guasha breaks up these “jams” of energy and gets blood flowing again to sore areas. “Sha” is best defined as the red splotches that appear on the skin from rubbing the spoon or tool repeatedly over the affected area. As you can see from my treatment I had a lot of “SHA” and it was not pretty! After an acute illness or injury the amount of redness, or sha, will be heavy post treatment. It may even appear there is bruising to the area. But my neck got some serious relief and mobility back after just this one treatment. I plan to do more in the future for sure! So what do you think? Have you tried any of these alternative treatments for pain relief? or would you give any of them a try?